Home Outdoor Lighting Architectural Projects How Do You Educate For Lighting? When one looks at the syllabus, lighting is the most neglected subject in Degree or Diploma Course in Architecture and Interior Design, or Electrical Engineering course. Lighting is just a small portion of syllabus in degree or diploma course of electrical engineering, and in Architecture or Interior Design Course this topic is covered under the broad subject titled Services. It is interesting to note that in developed countries, architectural colleges have taken the lead to introduce lighting in academic courses while in developing countries it is engineering colleges, which have taken lead. 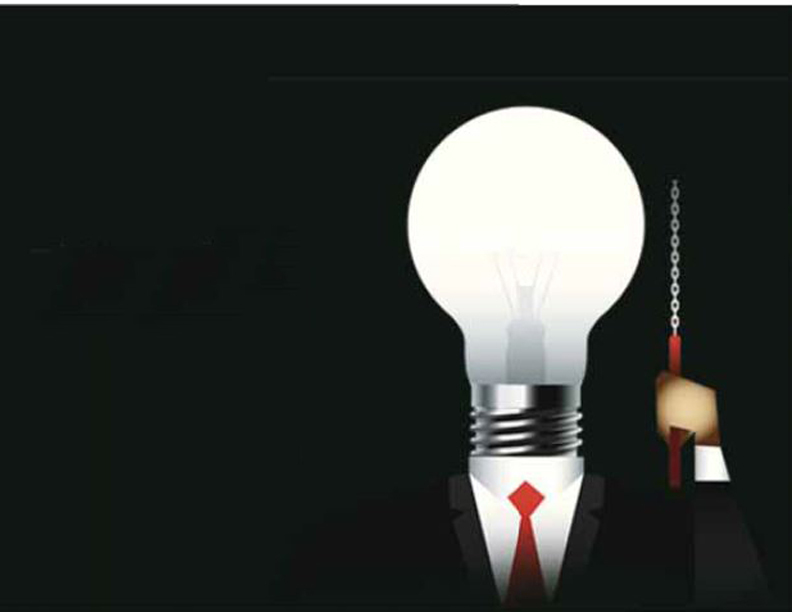 In India, the Academic Lighting Education leading to Masters of Science in Illumination Engineering exists in colleges which can be counted on fingers. Illumination Engineering is an elective subject (approximately 60 hours) for final year students of Electrical Engineering Degree Course in University of Mumbai, where the author had assisted in syllabus development, was paper setter and external examiner too. Now understand that they have revised the syllabus considering LEDs as one of the light sources. The author’s books titled “Designing With Light – A Lighting Handbook” and “LED Lighting Systems – All You Need to Know” are recommended as text books for this course. Now the initiative is also being taken by some Lighting Designers to introduce Masters Course in Architectural Lighting through some colleges in India. Within a period of just a few years the LED has become the dominant artificial light source and has taken over in nearly all fields of lighting applications. The LED has won and pushed other light sources in niche market. In less than a decade LEDification and Digitaliation have completely changed the way we work, live and play! LEDification involves selecting right type of LED and associated luminaire for any application which is the top driver for energy efficiency. DIGItalization involves the trend to provide solutions with use of daylight and sensors, use of presence detectors, sensible control of lighting, intelligent consideration of hours and use of complex digital systems with right type of LEDs and luminaires that control and manage light as required for human health and well-being. With LEDfication and DIGItisation the dynamics of architectural lighting design is changing and there is a need to redefine the design metrics and provide required skills and train the designers. This workshop has to be tailored to provide background knowledge and hands-on experiences for solving practical lighting design problems. Considering above scenario, it is recommended that without waiting for academic education to commence, thrust should be given to continuing education. This can be imparted through short term or practical oriented modular courses, seminars and workshops. With more than 45 years of experience in lighting field including lighting education, the author proposes Skill Development for Architectural Lighting Design Workshop. It should also be based on (Eight Credit) credit system for benefit of participants and can be conducted part time by any college/institute/professional body and association who believe in and want to promote good lighting design practices. In developing countries, the teaching of the subject is in number of hours but in developed countries it is termed as Credit Course. One Credit means 10 hours of teaching time. This includes lecture / tutorial / laboratory work (3 hrs) / studio work / seminar / workshop / consultation, mini project, etc. It is understood that a student also spends 10 hours of time for self-study. Lighting is a field that involves many areas of study. A lighting designer should have a clear understanding of the knowledge – technical awareness as well as a deep understanding of human physiology and psychology in addition to social, cultural, historical, and philosophical references. A lighting designer needs to have an understanding of all of these varied areas to provide a design that will meet the needs of the client. Lighting design is a process of informed decision making. Successful lighting designers work on a variety of projects that have different budgets, timelines, space types, team members, and visual objectives. Every project is a custom project. First step is to define the problem. Then apply a method for developing solutions that address the project-specific criteria, challenges, opportunities, constraints, and client expectations. It is known that lighting designers come from different backgrounds, including theatre, interior design, architecture, and engineering. Each discipline will vary in the specifics of the design process, but there is one characteristic shared by all – a good process encourages exploration of design alternatives by emphasising divergent thinking and creative solutions. The practice of lighting requires an understanding of the physical characteristics of light, how light works in space, and how it can be controlled optically and predicted and measured photometrically. Lighting designers also must understand technology, how lighting technology operates, how lighting systems are engineered, and the interaction of the various electrical and mechanical components that make up a lighting system. Today the control is part of the system which includes not only dimming but scene setting, CCT variation, RF control, Bluetooth Mesh, Internet of Things (IoT) and so on. To design lighting that meets the needs of people, a lighting designer must understand human vision, how the visual system operates, and the interaction of lighting and a variety of human factor considerations. Beyond this, lighting designers today must understand the interaction of lighting and human health: how lighting can impact mood, alertness, well-being, sleep quality, circadian regulation, and other aspects of human health. Lighting designers also must understand architecture and the art and process of design, including the integration of daylighting and electric lighting in the built environment. Finally, a designer must understand the application of lighting, the lighting specification process, and the process through which lighting is integrated into a building, a landscape, or other environment. To evaluate the architectural lighting design alternatives, one needs different tools like use of mock-ups, computer models and calculations by design programs like DiaLux, sketching with pencil and paper, use of Photoshop, 2D and 3D rendering and so on. These are all valid ways to gather information, make informed decisions, and work toward a solution. All of these methods lead to construction documents and product specifications. A good process, supported by the formal education and skill to make sound decisions, reduces the uncertainty in lighting design solutions and is the most likely path to repeated success. The demand for lighting design specialists is blossoming because a series of issues surrounding light and lighting as explained above cannot be appropriately addressed by generalised practitioners – Architects, MEP Engineers, Interior Designers or Landscape Architects. From above one can see that Lighting Design Syllabus must address all of these disciplines involved in lighting—physics, engineering, design, technology, architecture, human behaviour, health and so on for academic education. 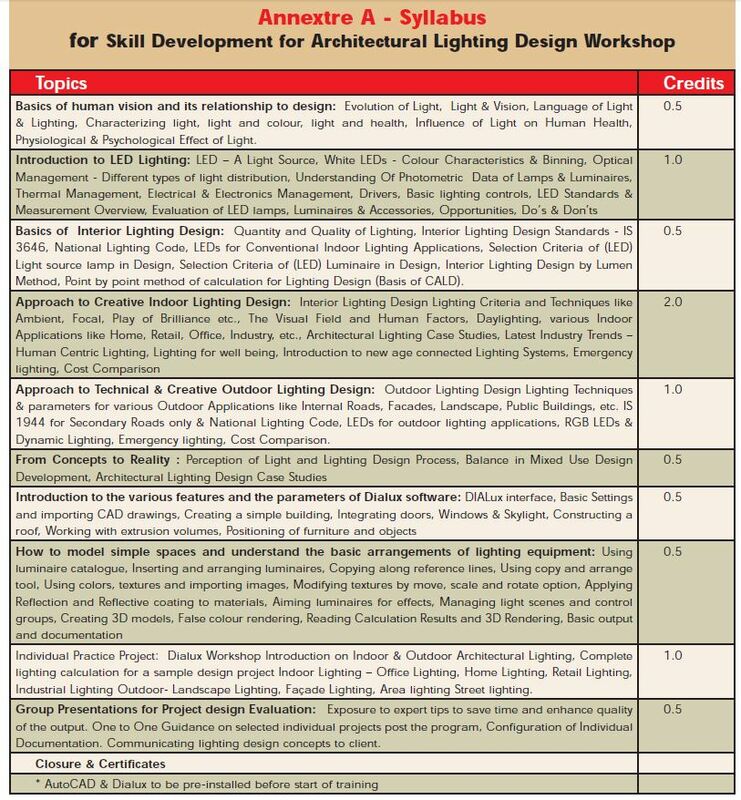 For the purpose of Eight Credit Certificate Course in skill development for architectural lighting design a guide syllabus has been designed as per Annexure A attached herewith. It is recommended that design colleges, lighting societies like ISLE, independent institutes, professional bodies like IIID, associations like that of builders and promoters and so on to take lead in conducting Eight Credit Certificate Workshop in skill development for architectural lighting design. This can be part-time or weekend course for the benefit of working professionals. The institute or college who would like to promote this course must have well-equipped studio with architectural material, finishes, models, LED lamps, chips, modules, etc., thermal and optical components, electrical and electronics accessories sensors, luminaires, and so on, for hand on experience. Should be equipped with small measuring equipment, to demonstrate various parameters like Colour CCT, CRI, new metrics as per TM30, Beam Angles and its effect on design, and so on. The studio also must have high-speed WiFi network for all students to work simultaneously on their laptops. Faculty for Certificate Course should be a Lighting Designer who have acquired knowledge through Academic Lighting Education and or through practicing lighting design. Architect or interior design with lighting education, knowledge of CAD, lighting software, Photoshop etc. should be preferred. But most important quality requirement flair to teach. The expert faculties can prepare and distribute the course material handouts to participants. Teaching aids must be the visuals in form of PowerPoint. Study books for further reading and references should be suggested. A project-based assessment pattern to be adopted for the applications modules in addition to the written papers and oral examinations. Proficiency Certificate to be issued by the institute duly signed by Course Director along with the institute /college /professional body office bearer. The Architects, Interior Designers and Landscape Designers who would like to do value addition to their design and enhance the material /features used by providing right type of lighting. Lighting Designers who want more depth in developing strong design concepts. CAD operators in design firms who want to learn the Design Process. Entrepreneurs in lighting business who want to promote their business through design. The representatives of lighting companies and dealers who want to grasp how designers incorporate new technology into their designs and like to promote or market their products on product quality and not just on (low) price. The specifiers, electrical or MEP consultants who would also like to incorporate lighting design in their projects with the similar technological and architectural thrust. Fresh Graduates and Diploma Holders in design field who would like to want to develop added enhancing their resume for job. Teachers of various design faculties who would like to enhance their knowledge for teaching. Design representatives from Builders and Developers who would like to improve their skills to interact with their own team, lighting designers as well as suppliers. Anyone interested in Lighting Design. Practice applying technical information such as tm-30 colour metrics, product cut sheets etc. to one’s designs. With advancement of lighting technology and its applications in built environment for people, skill development for architectural lighting design workshop will be the most appropriate for practicing people in the field to remain updated for implementing latest products and features in their designs.